Peer inside the mind of your prospect to create higher-converting landing pages. Not in a creepy way. Image source. Landing page optimization isn’t just about tactics. But if you don’t understand the more strategic side of things – the psychological wizardry that goes into a winning landing page – then your optimization efforts are just a shot in the dark. Here are three psychological principles that will help you make your offer more persuasive – and turn your landing page into a conversion gold mine. 1. The psychology of pleasure: What will make prospects feel happy? Epicurus was one of the first pleasure psychologists. People make choices based on what will make them happy. The pursuit of happiness is every individual’s greatest desire, according to the philosopher. No one is going to intentionally choose pain unless they think it will somehow make them happy. How do you apply the psychology of pleasure to landing pages? People think of themselves first. Focus on them. Use the word “you” a lot. Refer to their wellbeing, the choice they’re making and how it’ll make them feel. People feel happy when they have a clear sense of understanding about the product or service. Show pictures of the product in context, or at the very least, clearly describe it. People feel happy when they know that other people are happy (non-enemies, of course). Feature testimonials of happy, smiling customers. People feel happy when they are brought to a satisfying and logical conclusion. Use a longform landing page with a clear start, cognitive flow, conclusion and call to action. People feel happy when they read happy words. Write copy that is upbeat, delightful, optimistic and nonthreatening. The landing page below by KISSmetrics packs many of these psychological insights into one powerful, pleasing page. Notice their use of the word “you” (x2). Notice the clarity of the offer. Notice the smiling face. 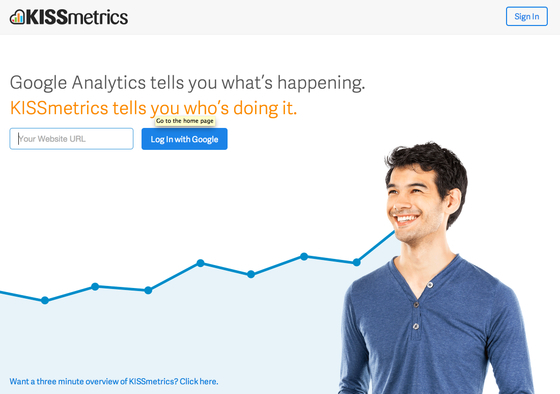 Notice how KISSmetrics does it all with absolute simplicity, obvious cognitive flow and an abundance of whitespace. 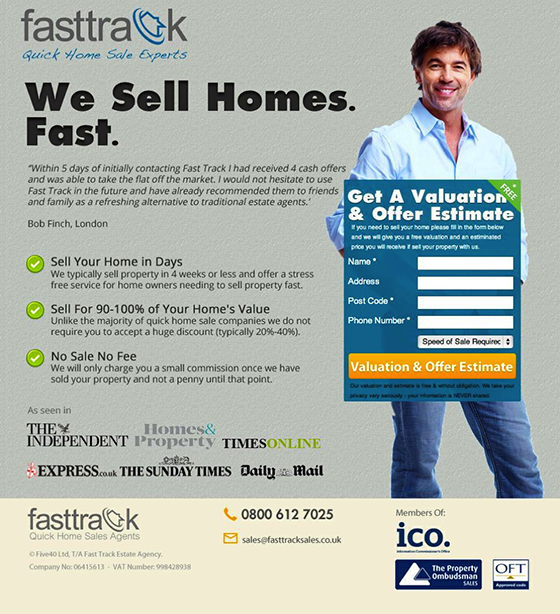 Or how about this landing page by Fast Track? See what’s going on here? They’ve got a picture of a smiling dude. The headline and supporting copy are highly optimistic. An anxious seller receives the assurance that this company will sell their home – fast. Just look at that upbeat testimonial! It’s impossible to find significant testing data when it comes to stressing happiness over other approaches. What he’s getting at is that every audience finds pleasure in something different. So you’ve got to test. What makes your audience happy? Learn the basics of the psychology of pleasure, then test. 2. The psychology of pain: What do they want to avoid? The magnitude of pleasure reaches its limit in the removal of all pain. Whether mental or physical, we’re wired to avoid pain. It sounds relatively simple, but understanding this can come in handy when setting up your next campaign. 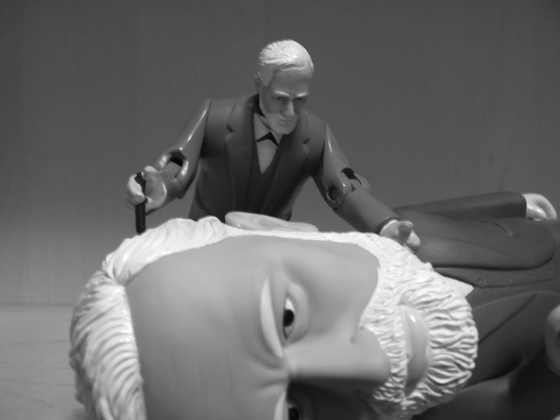 How can you apply the psychology of pain to landing pages? When it comes to apply the psychology of pain to your landing page, it’s about avoidance. What do your prospects most want to avoid? If you can cause people to remember or feel the pain of something, then they will respond by seeking to avoid it — and, assuming you’ve done things correctly, that means they’ll convert. It pinpoints where prospects hurt. The headline, “Do you hide your double chin?” exposes the feeling of shame that prospects may feel. Both the supporting copy and imagery (a woman trying to hide her chin from view) evoke feelings of embarrassment. If offers the solution. 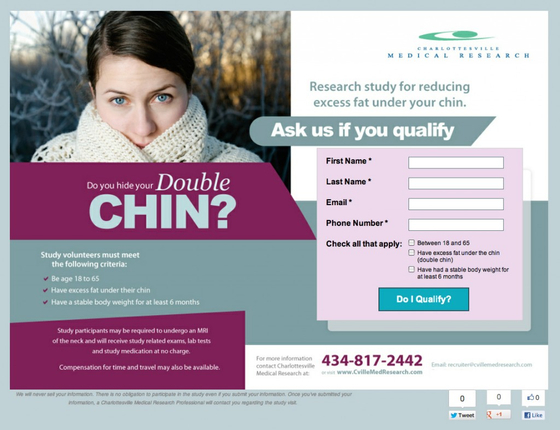 The headline above the opt-in form promises a potential solution, in the form of a research study for reducing excess fat under the chin. Bills.com cuts right to the heart of the matter. Image source. Many people feel a high degree of anxiety due to finances. Bills.com doesn’t shy away from poking that and digging around a little bit. They want you to feel the pain of your debt so they can help erase it. Starting the customer relationship off by making them think of pain and draws on individual incentives to alleviate that pain. And that results in a desire to find a solution – making prospects likely to convert. To help prospects convert, pinpoint where they hurt and then offer the solution. 3. The psychology of spending: How much do they want to spend? When it comes to spending there are two kinds of people in the world: spenders and savers. The paper explains that every customer that buys from you will land on your page knowing a range of approximately how much they want to spend. You can gently influence that price range with techniques such as framing, but the way they’ll react to the price of your offer is largely pre-determined and hardwired in their brains. 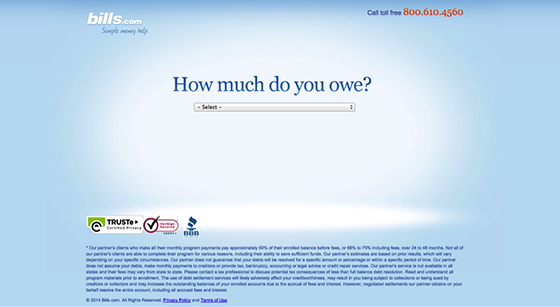 How can you apply the psychology of spending to landing pages? Find your prospects’ ideal price point and show them that number. If you understand the ideal price point for your prospects, why swim upstream? Go with the flow and tell them what they want to hear. Show prospects how much they’ll save by purchasing your product. Frugal people are driven by loss aversion. For penny-pinchers, the motivation not to lose something is greater than the desire to gain something; they want to see dollars saved. Similarly, you can experiment with telling penny-pinchers how much money they will lose if they don’t buy your product. Nailed it. 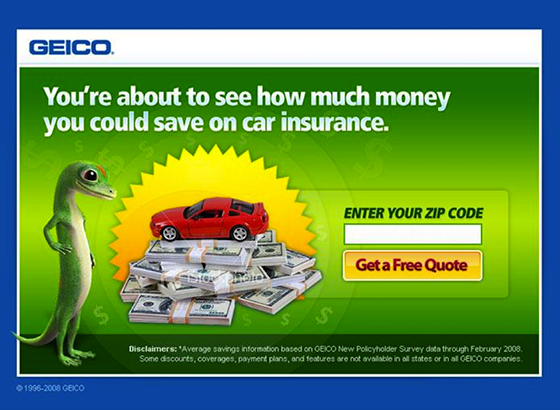 They consistently focus on how much you’ll save if you switch to their insurance. The psychology of spending can help you frame your pricing in a way that resonates with prospects. Peek under the hood of this wonderful thing called the human brain and you’ll find that there’s power in psychology. Just remember that these principles aren’t silver bullets for conversion. Understanding them simply allows us to formulate smarter A/B testing hypotheses. You still need to test. Our minds work in certain ways and operate on certain principles. When we grasp those principles, we are holding the key to unlocking torrents of conversions. Ready to create landing pages that really resonate with prospects? More to the point, are you ready to create pages that convert? Jeremy Smith is a serial entrepreneur, trainer and conversion consultant, helping businesses like IBM, Dow Chemical, American Express, Panera Bread, and Wendys improve conversions and strategically grow their businesses. Jeremy’s experience as the CMO and CEO of technology firms has given him a powerful understanding of human behavior and profit-boosting techniques. Join thousands of in-house marketers by downloading a copy of his latest ebook: Landing Page Optimization for In-House Marketers.